There's a current doctrine in the Body of Christ that needs to be examined in the light of the scriptures. There are those who, wanting to be great in faith, have taken to "commanding" God in their prayers. They don't "ask" Him. They believe they "release" the blessings with their command of "faith". Yes, the Bible clearly tells us that without faith it is impossible to please God, but there is an abundance of scripture showing us our proper relation to God Almighty and the proper attitude we should approach Him with in prayer. Consider this example (which I long for America to follow today on behalf of our nation that we might be saved). This is a prayer Daniel prayed when God's people were in Babylonian captivity. He was reading scripture Jeremiah had written over 800 years earlier that prophesied Israel being destroyed and the tiny remaining remnant being taken into captivity. It said captivity would last 70 years and then the people would be allowed to return to their land. It was now nearing 70 years. Today many would say, God went to all the trouble to prophesy all this over 800 years earlier, it's clearly His will, so - just name it and claim it! He has to do it because He promised to in the prophesy. This is how the man of God approached it, the heart, the attitude, the words he used. Bear in mind, God had mightily used this man with four rulers of Babalon and had also delivered him from the lions' den while as soon as he was removed from there, those who sought to have him killed were devoured while still being lowered down - not even touching the bottom yet. So, it wasn't that they just weren't hungry! Pretty strong confirmations that this man was approved by God and someone we should listen to and emulate. He devoted time to seeking God as a priority. He fasted and put on sackcloth as a symbol of his repentance. He started praying by confessing his sins to God and repenting of them. He magnified God by recounting some of His holy attributes to Him at the very beginning of the prayer, just as those who addressed earthly kings did before speaking to them. How much more worthy the God of the Universe. He took responsibility not only for his sins, but those of ancestors who actually committed the sins Israel was being punished for by their destruction and captivity. He was praying representing his people's cause. Though he was now an old man after serving four kings in captivity, he was very young when all that happened - likely too young to have participated in the sin himself. Yet, in bringing this before God Almighty, he takes responsibility for the sin of his people and repents. He acknowledges to God that His judgment was just - that the nation deserved the punishment for their sin of rebelling and turning away from God's commandments and ordinances and ignorning His prophets who were sent to call them to repentance (not to say that everyone in the congregation will have a huge personal ministry and get rich - which is what so called "prophets" do today - church leadership lacks spiritual discernement). He continues to praise and glorify God and acknowledge the sin of his people as he prays. He acknowledges that the captivity was a just punishment from God and not just another people conquoring them or some evil the devil has beset them with, but just punishment for their rebelling against God. He acknowledges that all this fulfills God's prophesies and promises. Just as He promises good and protection to those that follow and obey Him, He just as clearly promises misery and destruction for those who don't. He recounts God delivering them from Egypt in the past, recounting His mighty acts on their behalf. Then he "beseeches" God to turn from His righteous wrath toward them. Note, he doesn't "command" God to fulfill His word, free them and take them back to their land. He asks God "for Your own sake", (not to bless His sinful people for their sakes), to have mercy on the holy city and people He gave His name to. And while he was so praying, God sent the angel Gabriel to Daniel! I think that shows approval, don't you? Daniel 9:3-21 I hope you will take a moment to read this...and pray it on behalf of our dear America! 5We have sinned and dealt perversely and done wickedly and have rebelled, turning aside from Your commandments and ordinances. 6Neither have we listened to and heeded Your servants the prophets, who spoke in Your name to our kings, our princes and our fathers, and to all the people of the land. 7O Lord, righteousness belongs to You, but to us confusion and shame of face, as at this day--to the men of Judah, to the inhabitants of Jerusalem, and to all Israel, to those who are near and those who are far off, through all the countries to which You have driven them because of the [treacherous] trespass which they have committed against You. 8O Lord, to us belong confusion and shame of face--to our kings, to our princes, and to our fathers--because we have sinned against You. 10And we have not obeyed the voice of the Lord our God by walking in His laws which He set before us through His servants the prophets. 11Yes, all Israel has transgressed Your law, even turning aside that they might not obey Your voice. Therefore the curse has been poured out on us and the oath that is written in the Law of Moses the servant of God, because we have sinned against Him. 12And He has carried out intact His [threatening] words which He threatened against us and against our judges [the kings, princes, and rulers generally] who ruled us, and He has brought upon us a great evil; for under the whole heavens there has not been done before [anything so dreadful] as [He has caused to be] done against Jerusalem. 13Just as it is written in the Law of Moses as to all this evil [that would surely come upon transgressors], so it has come upon us. Yet we have not earnestly begged for forgiveness and entreated the favor of the Lord our God, that we might turn from our iniquities and have understanding and become wise in Your truth. 14Therefore the Lord has kept ready the calamity (evil) and has brought it upon us, for the Lord our God is [uncompromisingly] righteous and rigidly just in all His works which He does [keeping His word]; and we have not obeyed His voice. 15And now, O Lord our God, Who brought Your people forth out of the land of Egypt with a mighty hand and secured Yourself renown and a name as at this day, we have sinned, we have done wickedly! 16O Lord, according to all Your rightness and justice, I beseech You, let Your anger and Your wrath be turned away from Your city Jerusalem, Your holy mountain. Because of our sins and the iniquities of our fathers, Jerusalem and Your people have become a reproach and a byword to all who are around about us. 17Now therefore, O our God, listen to and heed the prayer of Your servant [Daniel] and his supplications, and for Your own sake cause Your face to shine upon Your sanctuary which is desolate. 18O my God, incline Your ear and hear; open Your eyes and look at our desolations and the city which is called by Your name; for we do not present our supplications before You for our own righteousness and justice, but for Your great mercy and loving-kindness. 19O Lord, hear! O Lord, forgive! O Lord, give heed and act! Do not delay, for Your own sake, O my God, because Your city and Your people are called by Your name. 21Yes, while I was speaking in prayer, the man Gabriel, whom I had seen in the former vision, being caused to fly swiftly, came near to me and touched me about the time of the evening sacrifice. National Scrapbooking Day is Saturday May 1st! 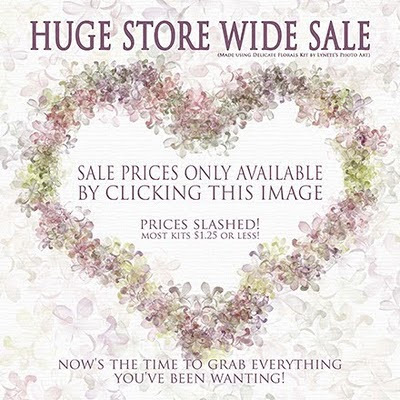 To help you celebrate, I'm going to put the whole store on an enormous sale (most kits at $1.25 or less), just for Friday, Saturday and Sunday, so be sure you don't miss out! YOU MUST CLICK THIS IMAGE TO GET THE SALE PRICES! 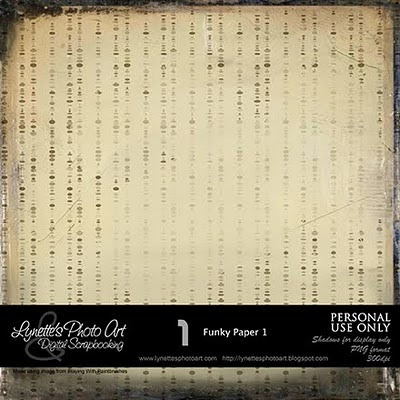 My gift for you today is this cool paper. I have another variation for you too - I'm planning on tomorrow. Enjoy! I used an image from Playing With Brushes in making this. I loved your post & the story of Daniel, thank you. Something we should all keep in mind! And thanks for the paper, too!